This was really nice. Great colors an unusual style. Great rendering but the rest doesn't move me. Felt fresh, but not very exciting. nice rendering, but weird theme and direction. random direction but it works well imho. Imo, by far the cleanest and prettiest of all the demos I've seen at Revisions so far. It's cool to see some experiments with different rendering tricks, but this was just bland in every way. Great visual quality but doesn't save it from the boring visual content. Thank you all for watching the intro! For those who whants to know how this intro is done, we use the a simplified version of the technique that iq explains here. Basically is a path tracing with 10 rays per pixel and some randomized rays work. Sorry, did not enjoy this. Decent tune, but looked like your average raymarcher with unusually eyecancerish colours. Whoa, inspiringly well done! 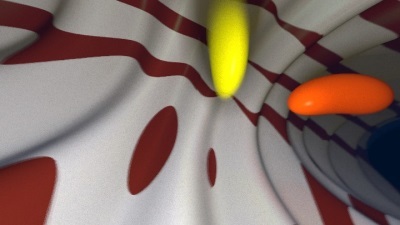 Like the much the fx, well chosen colors and especially the nice color bleeding/blurry reflections of the colored blobs. Nice track and visuals, like this grainy kind of look.. Thumbs up! Great visuals and a catchy ciptune!! superb! rulez added on the 2013-04-18 19:08:55 by ɧ4ɾɗվ. page created in 0.018845 seconds with 15 queries.